The UK Climate Coalition announced on Saint Valentine’s Day that British Prime Minister David Cameron, Deputy Prime Minister Nick Clegg, and Leader of the Opposition Ed Miliband had signed a joint agreement on climate policy. The leaders of the three main political parties—Conservative, Liberal Democratic, and Labor—pledge to work together on three key areas: achieving a new legally-binding UN climate agreement that limits global warming to two degrees Celsius; agreeing on a “carbon budget” that achieves the targets set in the Climate Change Act of 2008; and enacting policies that “accelerate the transition to a competitive, energy efficient low carbon economy” and that shut down coal-fired power plants unless they are equipped with carbon capture and storage technology. London’s political establishment has been in full agreement on global warming and energy-rationing policies for many years. The Cameron-Clegg-Miliband pact seems to me a potentially significant step beyond the existing consensus for at least two reasons. First, it means that climate policy will not be an issue between the three parties in the upcoming general election campaign. It will be up to the United Kingdom Independence Party (UKIP) to challenge the establishment consensus. Polling has shown that most Britons, like most Americans, don’t believe global warming is a crisis that warrants the ruinously costly policies supported by the three major parties. Second, the three leaders are clueless about the economic effects of their policies and so is the Climate Coalition that arranged the agreement as part of their “Show the Love” campaign. The reliably leftist Independent newspaper reported last year that 2.28 million British households now live in fuel poverty. Lucy Jolin writing last year in the equally leftist Guardian reported that there were an additional 31,000 deaths in Britain last winter from cold weather. 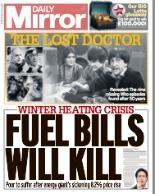 Many of those who died were elderly people who could not afford adequate heating. The Climate Coalition includes over 100 organizations as members, including Oxfam and Christian Aid. Paleolithic icecore data shows multiple variation in temperatures in the order of ten degrees Kelvin over mellennia preceding human life. This means that that there are natural causes independent of human activity that are greater than two degrees Celcius.